We’d love your help. Let us know what’s wrong with this preview of The Indispensable Calvin and Hobbes by Bill Watterson. To ask other readers questions about The Indispensable Calvin and Hobbes, please sign up. UPDATED! What can I possibly say? I love C&H. My kids love C&H. My daughter wants me to find her a Hobbes doll and REFUSES to accept Tigger as a substitute! Spaceman Spiff! Stupendous Man! Susie Derkins! Mom and Dad! Rosalyn! Miss Wormwood! A true classic and tickles your funny bones cover to cover! Based on the comments below. I felt I needed to define the Holy Trinity of Intelligent Comics for Old Nincompoops (ICON) which for me would consist of Bill Watterson, the father and son, Berke UPDATED! What can I possibly say? I love C&H. My kids love C&H. My daughter wants me to find her a Hobbes doll and REFUSES to accept Tigger as a substitute! Spaceman Spiff! Stupendous Man! Susie Derkins! Mom and Dad! Rosalyn! Miss Wormwood! A true classic and tickles your funny bones cover to cover! Based on the comments below. I felt I needed to define the Holy Trinity of Intelligent Comics for Old Nincompoops (ICON) which for me would consist of Bill Watterson, the father and son, Berke Breathed -ACK! !, and Gary Larson the spirit of the absurd. Perhaps readers like me that grew up in the 70s and 80s to have a trait seemingly lost in the generations X++, perhaps some of you learned as much about critical thinking from C&H, The Far Side and Bloom County than you did in your University classes on Philosophy and 20th C American Literature. It most definitely is Indispensable! The best cartoon of all time (Far Side a close second). Now that this in eBook I have it on my phone and can cheer myself up at any time. I have an uncle who I’ll call Uncle Bob. Uncle Bob is an extremely tall man; he has a booming voice and commanding presence. When he’s in the room, it’s hard not to pay attention to Uncle Bob. And that’s good for him, because he likes the attention; he laughs and jokes constantly, and loves a good audience. In short, he’s a natural born salesman. So Uncle Bob naturally excelled when he got his first job out of college selling tractors. In fact, he was so good that now he trains everyone else. Hi I have an uncle who I’ll call Uncle Bob. Uncle Bob is an extremely tall man; he has a booming voice and commanding presence. When he’s in the room, it’s hard not to pay attention to Uncle Bob. And that’s good for him, because he likes the attention; he laughs and jokes constantly, and loves a good audience. In short, he’s a natural born salesman. So Uncle Bob naturally excelled when he got his first job out of college selling tractors. In fact, he was so good that now he trains everyone else. His company is very fond of him, so he has plenty of vacation, which he uses to fish, to play card games, and to snowmobile. He is not a man of literature. My favorite comic strip ever, now in book form! Hilarious 6 year old boy(Calvin) and his adventures with his stuffed toy tiger(Hobbs). There is nothing to not love about Calvin and Hobbes. 5.0 stars. Second only to Gary Larson's "The Far Side" as my favorite cartoon series of all time. Always clever, always funny and always leaves you in a better mood. I just happened to pick this book up while visiting a friend, and, the next thing I knew, it was hours later. I read these when they were originally syndicated in my hometown newspaper, and I read Scientific Progress Goes "Boink" and The Revenge of the Baby-Sat. I could read these a million times and still want to read them again. These are definitely written to be appreciated on several levels, which is what makes them so rereadable. I had one perspective on them when I was young, and another no I just happened to pick this book up while visiting a friend, and, the next thing I knew, it was hours later. I read these when they were originally syndicated in my hometown newspaper, and I read Scientific Progress Goes "Boink" and The Revenge of the Baby-Sat. I could read these a million times and still want to read them again. These are definitely written to be appreciated on several levels, which is what makes them so rereadable. I had one perspective on them when I was young, and another now that I'm all grown up, myself. Calvin's antics aren't laugh-out-loud funny anymore, but bittersweet now that I can imagine raising such a holy terror. And the section about the break-in at their home, instead of inspiring boredom, seems very apt, and I can sympathize with the parents. I finally see the humor in Calvin's declaration that this is the coolest thing to happen to him. Most interesting is that I never understood how a bright kid like Calvin could do so poorly in school. It makes sense now, and I even understand why I didn't see it, before. Calvin's school isn't about nurturing creativity or teaching children to use their gifts. It's about teaching kids to sit down, shut up, and do their homework. Calvin is at his worst when he's told to obey for reasons that make no sense to him, and so of course he's going to the principal's office daily. Watterson also manages to paint a decent view of the female perspective, despite Calvin's view of girls as gross and slimy, and his mother as a dispenser of disgusting food, clean laundry, and torturous baths. I got the feeling that he really gets it. Trying to choose a favorite Calvin and Hobbes book really is not entirely unlike trying to choose a favorite child. These books were a seminal part of my childhood; I've reread them so many times throughout childhood, the teen years, and adulthood that I'm not exaggerating when I say that if you start quoting one of the strips, I can almost guarantee that I'll be able to give you the punchline from memory. "The Indispensable Calvin and Hobbes" is a treasury made up of what may be my two favorite Trying to choose a favorite Calvin and Hobbes book really is not entirely unlike trying to choose a favorite child. These books were a seminal part of my childhood; I've reread them so many times throughout childhood, the teen years, and adulthood that I'm not exaggerating when I say that if you start quoting one of the strips, I can almost guarantee that I'll be able to give you the punchline from memory. 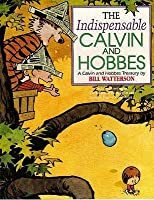 "The Indispensable Calvin and Hobbes" is a treasury made up of what may be my two favorite Calvin and Hobbes books: "Revenge of the Baby-Sat" and "Scientific Progress Goes 'Boink'." I think the bulk of all my all-time favorite C&H storylines are in here, including Calvin forgetting his bug report until the last minute (literally, the last minute), the Garage-as-Clubhouse incident (probably when I laughed the hardest at the strip), their first time-traveling adventure ("You mean we went into the past because we were FACING THE WRONG WAY?? 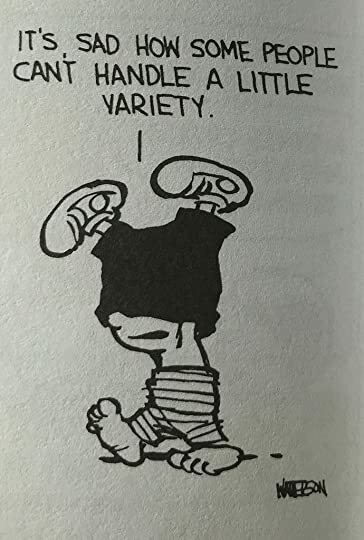 "), the army of Calvin clones, Calvin signing up to play baseball at recess (all my inner childhood angst about organized sports seemed to have been poured upon the page for this storyline) ... and my absolute all-time favorite, which I still relate to so strongly today: Calvin's mail-order beanie. The best thing about the Calvin and Hobbes books is that I grew up just looking at the pictures because I didn't read English, but found them so funny nevertheless. Then, when I learned English and was finally able to read them, they were even funnier because I could finally understand what the characters were saying. And as I grow a bit older and wiser, I still laugh whenever I crack one open, but for entirely different reasons. I love how there is something for every age in these books. Because, come on. Who can say no to Calvin and Hobbes? I practically grew up on the duo, and my whole family loved him, me and my sibs and father would share these books. Fantastic art, and fantastic stories - both humorous and poignant, though I sure as hell am glad Calvin isn't my brother or kid. Always a pleasure, always relatable. Love this! Read it. Over and over again. by Bill Watterson, published in 1992. 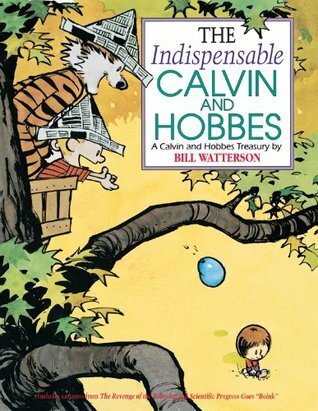 Another fantastic collection of Watterson’s Calvin and Hobbes cartoons. There is just so much fun and mayhem to enjoy in this collection it’s hard to quantify how great it is. 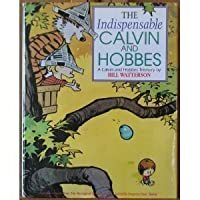 This collection, “The Indispensable Calvin and Hobbes”, is the collected cartoons of “The Revenge of the Baby-Sat” and “Scientific Progress goes “Boink”. Absolutely fantastic fun. In this collection we get to see the first appearance of Stupendous Man, Defender of Freedom, Advocate of Lib by Bill Watterson, published in 1992. In this collection we get to see the first appearance of Stupendous Man, Defender of Freedom, Advocate of Liberty! And yes, hilarity ensues every time Calvin puts on the caped costume and assumes the role. Also we get to see the formation of G.R.O.S.S, or Get Rid Of Slimy girlS. We get to see just how much Calvin does not enjoy camping with his parents, how he gets attacked by his food, how he is trapped in a world where, for him, gravity reverses itself and on and on. Other fantastic pleasures arise when we meet “Tracer Bullet”, private eye. And my personal favourite had to be the “Duplicator”, which is Calvin’s old Transmogrifier cardboard box renamed. He makes a duplicate of himself, and then the duplicate makes more duplicates until the house is filling up with Calvins. And yes, each one is just as naughty as the original. Great fun, and a great solution in the end of how the real Calvin deals with them - but I won’t give it away and spoil the fun. And all your favourites are here as well. This means more adventures of Spaceman Spiff, toboggan rides, wagon rides and Calvin as many types of dinosaur. Oh, and one more thing I will mention. We begin to see snowmen. But not regular snowmen, but the house of horror snowmen, or the city of snowmen that dinosaur Calvin stomps and eats. Very funny stuff which come to a climax in future installments of the cartoons. Not to be missed, this treasury is a goldmine of humour and what it is to be, and live with, a mischievous six year old boy and his tiger. For those wishing to collect all the strips of Calvin and Hobbes I provide the complete paperback listing below. This list will give you all the strips without having to collect all the paperback editions out there. A Thousand, Million Goodreads stars. But when it comes to my life, no comic/cartoon/Sunday Funny has been read by me more than Calvin and Hobbes. Indeed, Watterson may be the most influential writer in my life. I have more "goodreads quotes" in my goodreads quote section than any other author. And it's not even close. I want to retell the story of being banned from reading, or t A Thousand, Million Goodreads stars. 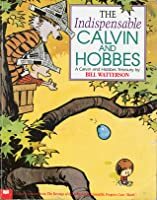 I want to retell the story of being banned from reading, or tell about the game my college roommate and I played where we'd flip open to any random page in any Calvin and Hobbes book and start a quote, and the other would have to finish it. Calvin improved my vocabulary, taught me subtlety (from his lack), and how sometimes friends are jerks. And often you're the jerk, but you can't recognize it in yourself. At this moment in my life, though, when I read it I came away with something else. I finished this at the end of June, 2016. Here in the U.S. we're in the middle of a... ...an interesting presidential cycle. 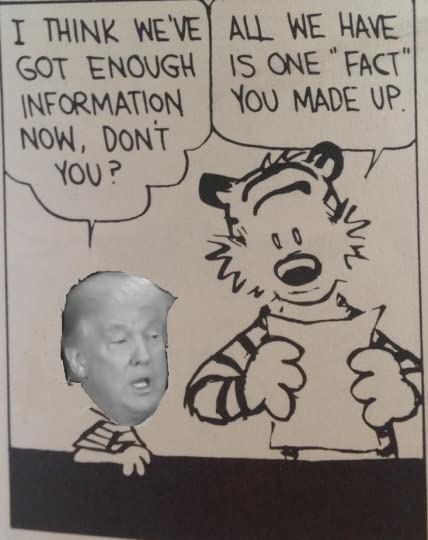 I noticed that Calvin is Donald Trump. Now, who knows? Maybe Trump will turn out to be a fine president. But Calvin seems to often match up with the persona Trump is creating. I was so taken by this revelation that I took a bunch of screen shots and posted it to Facebook. As it turns out, I wasn't the only one who noticed. As I said in my post, I feel bad about tying one of my childhood heroes to a person I personally don't care for. (True, on Facebook I was a little more direct in my feelings toward Mr. Trump...) But, lots of people took notice and have been photoshopping Trump's face over Calvin's face. I'm still not sure how to take it. Full of awesomeness. You'll never get fed up reading this book, even though you've read it ten times! I loved Calvin and Hobbes and I'm almost certain I own this, but it is in storage and I haven't seen it in over a decade. I was surprised at how some comics stuck with me almost word for word, while some seemed entirely new. It's also really neat how spending so much time with my niece has added a new dimension to these comic strips. I really love how nuanced Watterson's work is! Perfect antidote to a miserable head cold. Fun read, How can you not love Calvin... brings me back to reading Charlie Brown books under the covers with a flashlight. Sometimes my reading just has to be fun!! Still enjoy Calvin and Hobbes no matter how many times I re-read it. This book is also porcupined with markers. I'm pretty sure I have both The Revenge of The Baby-Sat and Scientific Progress Goes "Boink", but this book also has cartoons that don't appear in either. Comic strips have been through several Golden Ages. Calvin & Hobbes was part of the twilight years of one of these. I never have quite understood the contempt for comic strips on the part of some people. Many are, in fact, 'great literature', in every sense. They're not at ALL 'simplistic'. They de This book is also porcupined with markers. I'm pretty sure I have both The Revenge of The Baby-Sat and Scientific Progress Goes "Boink", but this book also has cartoons that don't appear in either. I never have quite understood the contempt for comic strips on the part of some people. Many are, in fact, 'great literature', in every sense. They're not at ALL 'simplistic'. They deal with complex concepts, and often in succinct ways that longer disquisitions fail to equal. If one could wish some things improved (such as Calvin's repeated demonization of the charming Susie Derkins)--well, what has no room left for improvement? Even something 'perfect' like this strip (in the sense of completed, at least) is bound to have its flaws. There is something mystical about childhood, something that makes it all but impossible for us adults to overcome it. Calvin and Hobbes captures the magic of childhood and helps us return to it. We are there to witness Cavlin's cardboard-box adventures, we experience his impatience while waiting for his propeller beanie to arrive, and we sympathize with his angst regarding bedtimes and homework. There are some things about life that even adults don't understand though, things that as a child you There is something mystical about childhood, something that makes it all but impossible for us adults to overcome it. Calvin and Hobbes captures the magic of childhood and helps us return to it. We are there to witness Cavlin's cardboard-box adventures, we experience his impatience while waiting for his propeller beanie to arrive, and we sympathize with his angst regarding bedtimes and homework. There are some things about life that even adults don't understand though, things that as a child you assumed you would understand some day but in reality had a better handle on when you were a child, without prejudice and worldly knowledge getting in the way. But in the end, Calvin and Hobbes bring back the simplicity of childhood, taking you back into a world where ultimate happiness can be achieved by digging in the dirt or taking pictures of plastic dinosaurs. Strangely enough, this is one of the most influential books of my life. Read it as a kid, and loved it. Reread it piecemeal several times over the years and loved it every time. I try not to read it with my kids though because it gives them dangerous ideas. I love Watterson's artistic drive. As his strip became more popular he negotiated with his syndicate to get more control over the format. If I recall, he lost about half of his Sunday sales, but he gained the freedom to work outside the box. I Strangely enough, this is one of the most influential books of my life. Read it as a kid, and loved it. Reread it piecemeal several times over the years and loved it every time. I try not to read it with my kids though because it gives them dangerous ideas. I love Watterson's artistic drive. As his strip became more popular he negotiated with his syndicate to get more control over the format. If I recall, he lost about half of his Sunday sales, but he gained the freedom to work outside the box. It really shows in his work. Waterson thinks big words are funny, and he puts some whoppers in the mouth of 6-year old Calvin. It was funny then and it is funny now. I used to read them from cover to cover in a day. One thing, it's easy to read because they're just comics, so not many words. Second thing is that the jokes are simply hilarious and I wanted more. I love Calvin and Hobbes! Calvin & Hobbes classic childhood read, you laugh then at the innocent jokes but when you get older and look back on it, you reminiscene and laugh at childhood be it your own or just overall. The relationship between Calvin and Hobbes is wonderful, the best bud until the end thing that we all need and deserve, reading the comics again it makes me smile..it's adorable. I don't know what my childhood would have been without it.